When yarn becomes what it is meant to be it is a beautiful thing, no? This stuff drew me in a couple of years ago. Back when I had just one tiny bunny, who could easily be carried into yarn shops in a sling and would cozy on my belly without trying to unwind each skein in the joint. I think I gravitated towards it because of the color and the texture, which just screamed BEACH!!!! I had just moved to a town known for rain and some part of me must have missed California. I scooped up several skeins and promptly tried to turn them into a cardigan. Sigh. It was a typical beginner’s mistake. The cardi turned out fine, but this stuff is a drapey, rather heavy cotton. It was heavy and bulky. In other words, it was never meant to be knit into sleeves. This modified version of the chickami is what this yarn was meant to be. It is SO satisfying to see it at it’s full potential. I wore it out this weekend and it is beautiful. Ahem, I am a bit more endowed than Maude so the fit is a little more snug than you see here, which is actually just perfect. And it’s funny, if you asked me I would tell you I HATE summery knits and would prefer always to knit something wintery but then I finish a project like this one and suddenly my mind can’t stop thinking about other, summery possibilities (scroll down for the AMAZING sweater). Sunrise Circle, originally uploaded by bnnymama. Here it is, modeled by my lovely half mannequin Maude. The button is vintage from one of the $1 Maternity (well for me they were maternity) sweaters I scored at St Vinnie’s last winter. 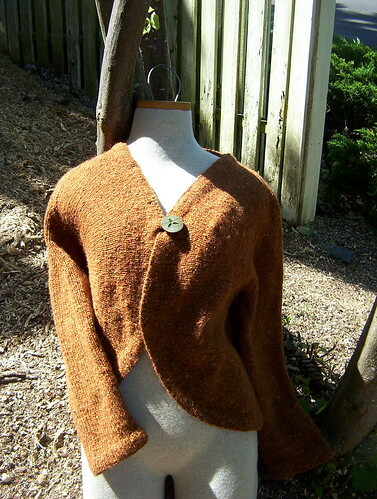 The wool from that sweater is waiting to be re-knit, but the button is just perfect for this sweater. I just adore everything about it. The color, the wool, and especially the knitting. Ms. Gilbert is a genius. You are currently browsing the Bunny Slippers blog archives for June, 2007.